Have you ever wondered what it would be like to partake in a murder-mystery with a bunch of your closest friends? Well, Joey Graceffa made that a reality, creating the thrilling YouTube Red Original Series, Escape the Night. It's a reality adventure series that takes place in the Roaring Twenties, but features a bunch of your favorite YouTube stars. "We’re thrown into this house and a murder takes place and we have to solve this murder. It kind of turns into this Clue-esque show, but with a Survivor-type twist. It throws the YouTubers against each other, they have to work together and just trying to solve mysteries while staying alive," he told us. Since there's that reality TV element, when you see GloZell, iJustine, Lele Pons, Shane Dawson, Eva Gutowski, Andrea Brooks, Timothy DeLaGhetto, Matt Haag, Oli White and Sierra Furtado react to scary creatures and things that pop up, they're really reacting to it! It's 100% authentic. 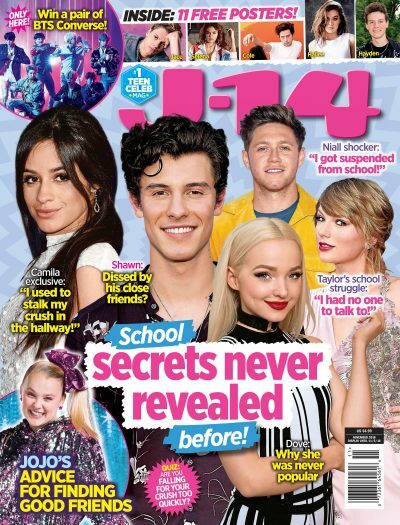 In the EXCLUSIVE clip that J-14 is premiering below, Joey and friends work to uncover the hidden keys — and you can feel the dramatic tension build. Are you excited for the show? Click through the gallery to find out more secrets that Joey revealed. The show started as a murder-mystery party. “I wanted to have a murder-mystery type dinner with my friends, and I was trying to research companies that come in and transform your house into that sort of setting, where you’re at a dinner table and you have prompts and stuff. Then I kind of wanted to take it up a notch and put cameras in the room. When YouTube came around and wanted me to pitch shows, this was just an idea that I threw out,” Joey told us. Even though Joey created the show, he didn’t know everything that would happen in it. “The only thing I didn’t know was the clues. I wanted to like be a contestant on the show, so I was like, ‘I’m going to take a step back after it’s outlined…I don’t want to know exactly how it’s going to happen or when or how to solve certain clues. I wanted to get genuine, real reactions from myself’,” he told us. Their shooting schedule was super-intense. "It was five consecutive night shoots and we filmed two episodes each night, so we would start maybe around 10pm…and then [we'd] wrap around 6am," he spilled. "So it was really intense and it was really difficult between episodes because it was the middle of the night and we were in a trailer, just sitting on our couches getting really relaxed [and then had to shoot again]. So that was the most challenging part, I think." There were creepy moments galore. “One [time] we were all in the living room, reading a clue. All of a sudden, there bursts out of nowhere a guy banging on the window and we all freak out and start screaming and then just run off. But there’s so many of those types of things where we just don’t know what’s behind the next door or what we’re going to see next, which always kept us on our toes and on edge," Joey revealed. They shot the show in an actual house, and it turned out really creepy. "The actual location was about 45 minutes outside of L.A. and it was this beautiful manor-like home. There’s also a really crazy dungeon-like basement. And the house was like four or five stories tall, so there were so many rooms and fun things that we got to play around with. [The team could] create secret passages, secret hidden rooms, stuff like that," he said. Lele Pons was the craziest person on set, in the best possible way. "There were a lot of funny moments that happened, especially with Lele Pons who is a Viner/YouTuber. She is on a whole other level than the rest of us! She would just make us laugh so much, just because of how wild that girl is. She would fall out of the trailers. She would just fall on the ground constantly and get up like nothing happened. She’s a wild girl," Joey said. Joey wanted to cast YouTubers who would be willing to play along and not hold back. “Aside from scheduling, it was really important that I pick people that I knew would have really fun reactions and really get into it. I wanted people who were willing to commit to what this show was. I didn’t want people who were not going to take it seriously. [I wanted] people that have a good imagination and play with what’s happening and [can] almost just pretend like this stuff’s really happening to us,” he told us. Joey's favorite part of shooting the show with his fellow YouTubers was bonding with his friends in a whole new way. "I think that was one of the funnest parts, just getting to interact with your YouTube friends in a way you haven’t before. We’re thrown into these crazy situations that you [can't help but] bond over. I can’t believe we all experienced that — staying up super-late, being exhausted and then being thrown into [crazy situations] like, ‘Get awake, and be prepared for what’s going to come'," he said.